I’m going to tell you a story. I’m not proud of it. In fact, I am the grand coward, an elephant afraid of a mouse. And while it would be more comfortable to talk about empowerment at moment where I am a woman standing her ground and facing her fears, that superwoman cape is fake. I have a hidden when asked to lead. 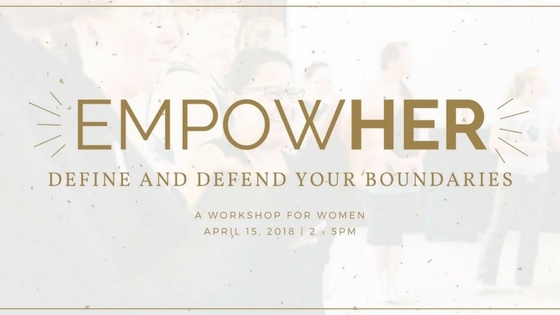 To understand the EmpowHER Workshop and it’s impact, it’s important for you to SEE me at my weakest so that you understand why I’m a woman hungry for better. Everything changed for me in college when I found out my friend had been beaten by her boyfriend. A boyfriend who also happened to be my close friend. Until that day, I would have sworn that when asked to take sides I would have chosen the victim. How could I not? I’d experienced sexual assault. I knew the shame. I knew the fear. I had first hand knowledge of what it meant to be both believed and ignored. It’s almost inexplicable, today, how I chose the perpetrator. Despite my past, in the end, I picked the person who offered me what the victim could not – The opportunity to live my life as if nothing were different. In a defining moment, I shrunk when life asked that I expand. So while, today, I can shout, “NEVER AGAIN” it’s because I saw my mistake as a clear violation of my values and needed to understand why I had found it impossible to take a stand. What I DISCOVERED were layers of false narratives about pretty, little, mild, pure and damaging ideas surrounding perfection, image, loyalty, being liked, being admired, and falling into line. Today, I am unwilling to pass on these beliefs to my daughter and refuse for my son to passively absorb them. I rise up to the bar that empowers my baby girl and all women the freedom to DEFINE female outside of confinements that keep her quiet, small, and in line. That has meant purposefully using adjectives like big, strong, and heavy to describe myself and other women positively. Letting the rolls on my belly be seen at sweatlocal and on social media because something as simple as NORMAL defies the impossible physical standards we are asked to reach. Openly speaking about fitness in the context of sexiness and not just health because I can create both FOR myself instead of as an offer TO someone else. And now, in 2018, The EmpowHER Workshop. … Because it’s time for me to stop talking and for all us to EMBODY the woman we dream our daughters to become. A woman living in alignment with values she has defined for herself and is unwilling to apologize for standing up when those boundaries are crossed. I hope you join us on April 15th from 2 -5 pm as author, speaker, and activist Erin Brown leads us through a transformative evening of introspection and empowerment.